To enter the contest, submit your name suggestion for the mascot as well as your complete contact information. Submissions will be accepted from 8:00 a.m. on Monday, March 3 2014 through 11:59 p.m. on Sunday, March 16, 2014. Duplicate name entries will be credited to the first respondents. On Monday, March 17, 2014 finalists will be announced and voting on the final name will begin. Visit the Rail Runner website to vote for your favorite name. 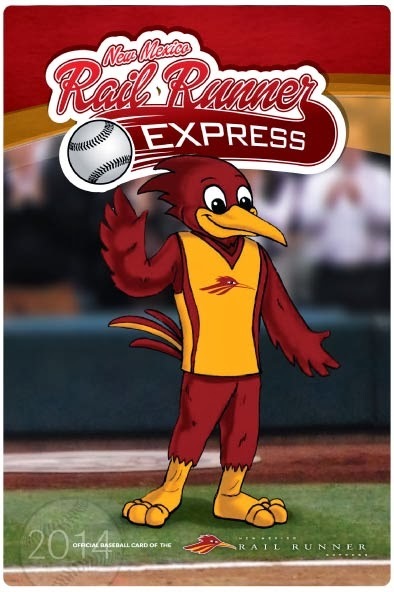 The contest winner and winning mascot name will be announced on Friday, May 2, 2014 at the Albuquerque Isotopes baseball game. Finalists will receive free entry to the Friday, May 2, 2014 Albuquerque Isotopes game.